Award winning Newport photographer Chuck Forinash invites you to visit his gallery of coastal images, located on the Coast Guard end of Newports' Historic Bayfront. We offer a large selection of creatively framed fine art photography. This is the official online site of the Forinash Gallery and photographer Chuck Forinash. For directions to the gallery, click here. For contact information, click here. Check back to see the progress on this constantly updating site. 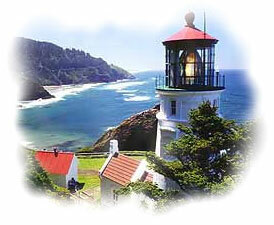 Excellent selection of Northwest Lighthouse photography from British Columbia to Northern California. Oregon Coast Bridges, man and nature working together. Stunning Ocean Sunsets, the colors are unbelievable. Aerial Photography, a bird's eye view of the Oregon coast. Poster Art from A to Z. Historic Images...people and places from the past. Candles from Newport Bay Candle Company. Glass Floats from Pyromania Glass Blowers. A wide variety of Glass Art. Gourmet Coffee from Newport Bay Coffee. Poppy Seed Pancake Mix from the Whale's Tale Restaurant. Refrigerator Art and one of a kind creations. Handcrafted Jewlry with vintage beads by Jeanette Volk.